A fire broke out at the Annapolis Yacht Club on Saturday, spurring road closures and warnings to avoid the downtown area. 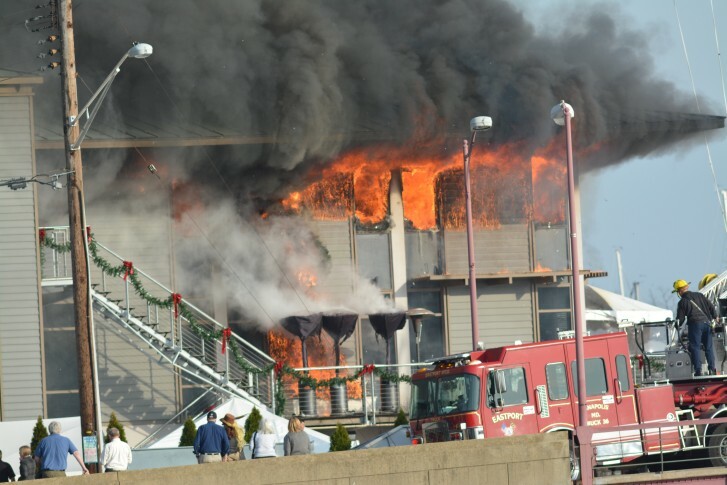 WASHINGTON — A fire broke out at the Annapolis Yacht Club on Saturday afternoon, spurring road closures and warnings to avoid the downtown area for hours. The fire was dispatched at around 2:15 p.m. Ninety-five firefighters and two fire boats responded. Two firefighters were hospitalized for minor injuries. There were no reports of civilian injuries, according to the Annapolis Fire Marshal’s Office. The fire was under control by 3:30 p.m. was extinguished at around 7 p.m.
Fire officials were still determining what caused the blaze. Capt. John Bowes said it was too early to estimate damage. The building did not have sprinklers, Bowes said. Annapolis police said several streets in the downtown area were closed to pedestrian and bicycle traffic due to a “very dangerous situation.” Traffic was reopened at around 9 p.m. The Eastport Yacht Club’s Parade of Lights was cancelled due the fire.